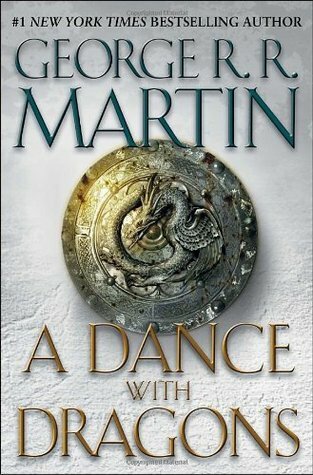 Finally I read A Dance with Dragons by George R.R. Martin, with more than enough time to spare before The Winds of Winter is set to released. I don’t think this was the worst of the 5 enormous books, but it also wasn’t the best. I give A Dance with Dragons by George R.R. Martin four out of five hearts because I thought it had some better quality than most of the novels except for A Storm of Swords. I really enjoyed reading the pieces by Tyrion because of his struggles between his name and staying alive. He is a Lannister, used to riches and service, but because he killed his father he needs to take care people don’t kill him because of it and find Danny to help her clean the Iron Throne. But first he has to survive storms, boat trips and becoming a slave. His humor is something I really like. Daenerys is trying to keep her soldiers alive while assassins are trying to pick them off and a plague is going around. In the mean time she tries to keep her dragons together and get into a good marriage while she is in love with someone else and there are others who are asking for her hand. I enjoyed these squables, but I mostly liked the chapter where she is assumed dead by her friends, even though she is just lost in the Dothraki Sea. Most of all I missed Sansa’s presence in this novel. I think she could have done some interesting things and I really like her as a character. The entire series will never be, for me, a five heart read because there are way to many characters to keep an eye out for. I understand that all the events in the novels couldn’t have happened to a less grand cast, but George could have cut half of these events and it would still be interesting to read. Overall I think this series has way to many characters and pages, but if you really want something epic I would say go ahead and read these bricks of books. This entry was posted in Book Review and tagged Adventure, Book Review, Drama, Fantasy, George R.R. Martin, Mystery, Romance. Bookmark the permalink.